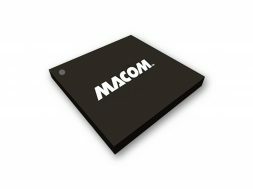 The MAAM-011101 operates from 4 to 20 GHz and features 16 dB typical gain and +18 dBm of output power. The input and output are fully matched to 50 ohms with a typical return loss better than 12 dB. Small signal linearity is typically +30 dBm and reverse isolation better than 28 dB. This device requires a minimum of +5V, typically +8V, and maximum +10V for standard operation. Typical current is 45mA. The unit’s typical usage is as a system buffer amplifier, gain block, mixer LO driver, power amplifier driver requiring small size and high performance. Typical applications are for Wi-Fi, WiMAX, point-to-point radios, IMS, EW, and aerospace and defense. The MAAM-011101 is housed in a leadless 1.5 x 1.2mm package that is small yet can be handled and placed with standard pick and place assembly equipment. It is fabricated using a GaAs process which features full passivation for increased performance and reliability.